Page description: 6 black and white pictures. You can either scroll over each image for a photo description or scroll down on this page for a description for each of the black and white images. 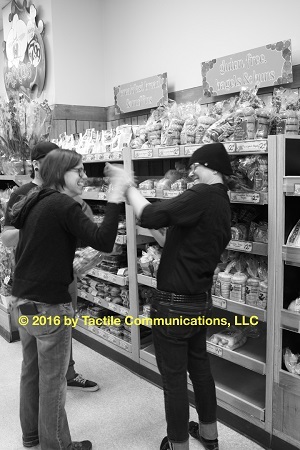 Image description: black and white (b&w) picture of three people, two females and one male, in Trader Joe’s (a food store). From left to right, a male, Ray, is slightly hidden behind Hayley on the left and aj is standing to the right. The three are standing in front of a shelf stacked with different types of bread. Hayley is tactiling with aj, both are smiling big. 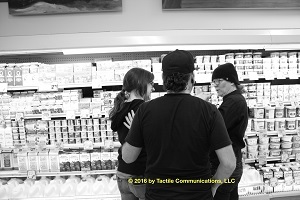 Image description: b&w picture of three people standing in front of a dairy section in Trader Joe’s. There are stacks of different types of dairy products on the shelves in the background; a male, Ray, signs with Hayley. aj has her left hand on Hayley’s shoulder, while her right hand holds a white cane. 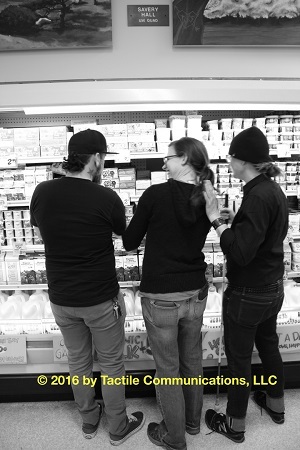 Image description: b&w picture of three people, two females and one male, standing in front of a dairy section in Trader Joe’s.Hayley, wearing a pair of glasses, is standing to the left, Ray with his back to the camera is standing in the middle, and aj is standing to the right. aj also has a pair of glasses on. While aj is tactiling with Hayley, Ray looks on with his left hand on Hayley’s shoulder. 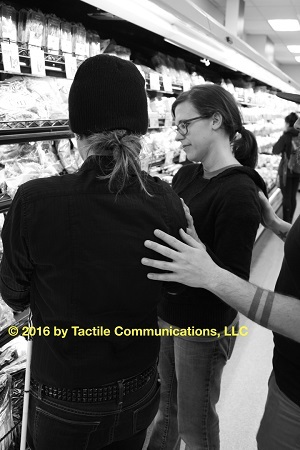 Image description: b&w picture aj and Hayley, in a refrigerated section, looking at a dairy product, while Ray stands behind them with his hands touching both. aj is wearing a black winter hat and black shirt. Hayley has a pair of glasses on, hair pulled back in a pony-tail, and is wearing a black shirt. 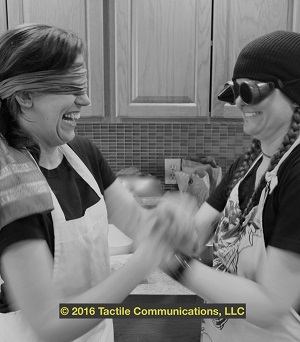 Image description: black and white image of two women (Hayley and aj) standing in front of a kitchen counter, one blindfolded and the other has a pair of goggles on, ProTactiling. The woman blindfolded is laughing, while the woman wearing a pair of goggles is smiling big. Image description: black and white image of a pair of hands and a hand; a hand is resting over one pair of hands (ProTactiling). 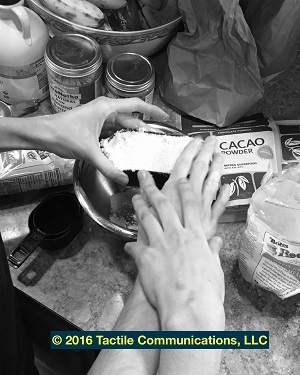 At the same time, these pair of hands are holding a measuring cup over a bowl, which is filled with almond flour. In the background, there are different items on the counter.